Double weave is a family of weave styles in which the face of the fabric is effectively disengaged from the back except at specific connecting interlacings, yet with each side maintaining sufficient individual structural integrity to be identified as distinct fabrics in themselves. Fabrics in this category include the matelassés and tubular fabrics. These fabrics are encountered in both decorative and utilitarian roles and occupy interesting extremes at either end of those spectra. 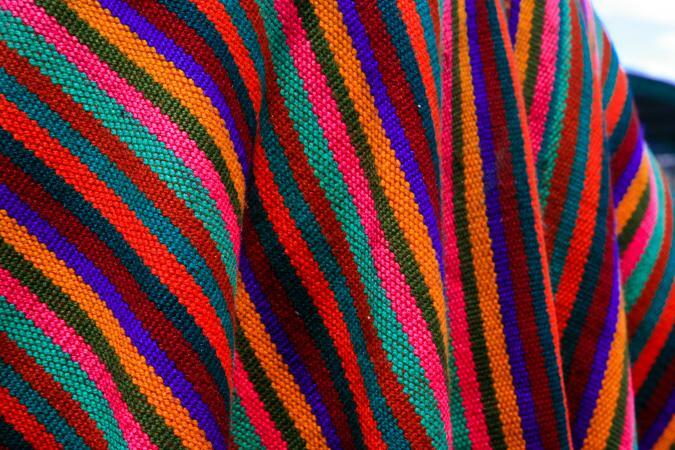 The matelassé types of fabrics are decorative in nature and may be found in use as bed clothings and upholsteries. Utility double fabrics have been employed in roles as diverse as common garden gloves to highly technical, specialized end uses. Double weaves are characterized by harness floats in paired or greater combinations on a face and different paired or greater float combinations on the back. The sets of floats are maintained as a distinct single fabric by warp yarns that alternate at long intervals between front and back of the cloth. The simplest representations of double weave interlacings utilize both a point diagram and the filling cross section diagram to show alternations between top and bottom. In such diagrams, the warp yarns may be represented by each end to permit easier visualizations. Multiple repetitions of each end weaving pattern combine to permit the double face of a fabric. Further considerations in double weaves include whether shuttle or shuttleless weaving techniques are used and whether simultaneous weft insertions in top and bottom sheds occur. If shuttle weaving is employed, a continuous loop of weft yarn is inserted across the width of the fabric. This technique permits the weaving of an unbroken, sealed tubular fabric. Technical uses of this fabric type include vascular grafts and spacesuit joints. In the latter role, a double weave tubular fabric was developed at Georgia Tech in the 1970s and 1980s by Dr. Howard Olson for elbow and knee joints as the first solution to prevent vascular destruction of astronauts' arms and legs during bending motions. If shuttleless weaving techniques are used, discontinuous segments of weft are being inserted and therefore tubular structures cannot be made on these machines. On the other hand, multiple simultaneous insertions of weft by rapiers is easily practiced by these machines, so top and bottom shed formations and independent insertions are possible. A subtype of these double weaves are velvets, which are formed with a migrating binder warp that is cut after weaving to form a pile on the surface of either fabric base. See also Loom; Pile Weave; Slack Tension Weave; Weave Types; Weaving. Collier, B., and P. Tortora. Understanding Textiles. Upper Saddle River, N.J.: Prentice-Hall Inc., 2001. Emery, I. The Primary Structures of Fabrics. Washington, D.C.: The Textile Museum, 1980, pp. 156-160. Gioello, D. A. Understanding Fabrics: From Fiber to Finished Cloth. New York: Fairchild Publishers, 1982. See Double Cloth and Double-faced Cloth, p. 101.